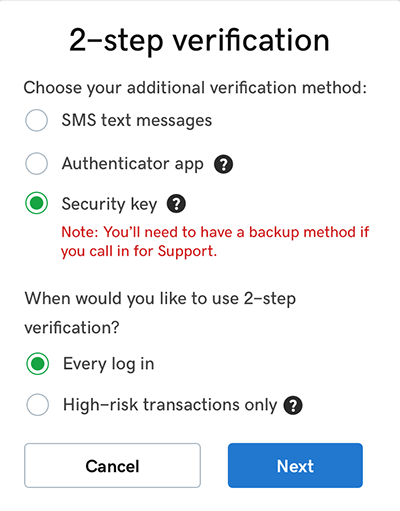 For the best available account security, you can enable a hardware security key for two-step verification (2SV). We support USB or Bluetooth-enabled keys that meet the FIDO U2F standard, such as many Yubikeys or Google Titan. Note: If you use a security key, you need a backup method so Support can verify your identity. We recommend an authenticator app for much better security than SMS messaging. 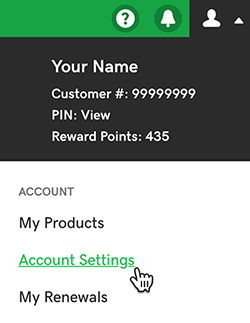 For info on setting up the app, see Enable two-step verification. Click Login & PIN, and in the 2-step verification section, click Set up. Below Choose your additional verification method, select Security key and then click Next. Have your security key nearby, but don't connect it yet. Click Next and then follow the onscreen instructions. Once we verify your key, you'll see a success message. Below Choose your additional verification method, select Authenticator app. Click Next and follow the onscreen instructions to set up the app as your backup authentication method. Sign out of your account, and then log in using the hardware key to check your key setup. O que é imposto sobre valor agregado (IVA)?